Elegance in a home is achieved through quality, craftsmanship and detail. Whether creating plans for a new custom home or updating the style of your home, wrought iron doors establish stately, old-world elegance and create a dramatic first impression. The entrance to a home or estate conveys both security and privacy. Integrating a wrought iron door invites the visitor to peek inside an entryway or courtyard. Details may be simplistic and combine solid textures – from wood and stone to iron and glass – or elaborate with interior double wrought iron doors framed in a custom iron or stone entry. 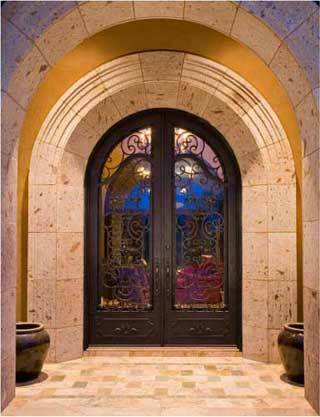 Any custom luxury home may integrate a wrought iron door that conveys a welcoming invitation to visitors. The entry details can incorporate classic ornamental iron door design or a modern more simplistic design that captures the aesthetic of the home’s architectural and interior design. Introducing well crafted wrought iron doors in a Spanish motif with stucco and wood creates an elegant European style – stunning in a Southwest location and distinctive in any location. Ironwork in the interior, such as iron railings or cabinetry hardware, continues the luxurious aesthetic established in the entrance. A home is a reflection of the owner’s distinctive style and persona. A wrought iron door is functional – providing security yet letting in light to create an open airy environment. Integrity in the quality of iron doors make them distinct design features and the focal point of a home’s entrance. Whether designing a custom home, updating the style or enhancing your home with design details, a wrought iron door can invigorate the entrance. Find a wide selection of unique iron door designs to suite classic or modern architectural designs at Portella Iron Doors.